On Tuesday October 23rd, our 4th class soccer team went to Midleton AFC for a 4th class blitz. In our first group game we lost 5-1 to Gaelscoil Ballyphehane with Andy Cuthbert scoring a late consolation goal for us. This was followed by another heavy defeat, this time at the hands of Carigtwohill Boys School. The score was 6-2 and our scorers were Samuel Richard and Andrew Hinds.Next up was St John the Baptist school from Midleton. We again lost, this time 4-2. Dominic Juric scored both of our goals.Our final group game was against Dungourney NS. Through some fantastic goalkeeping by Eugene O'Brien, we dug out a great 4-2 win with goals from Andy and an Andrew Hinds hat-trick. This left us in a 'Golden Goal' playoff situation to reach the semi-finals. After 6 tense minutes we finally scored through Andy Cuthbert, booking a place in the semis. The semi-final was against St John the Baptist who had topped the group with 10 points. (We had finished on 3). Despite going 4-1 down in the semi-final, the boys showed great fight and determination to dig out a magnificent 6-4 win. This time it was Jack O'Rourke who scored a hat-trick, as well as Andy, Andrew and Dominik. In the final we played Carrigtwohill where we lost 4-2. Eli Murphy Mckeon was superb in goal and Jack and Andrew scored for us.The boys had a great day and behaved themselves from start to finish. Last week, 4th class created a map of Bishopstown. We divided Bishopstown into 16 parts and the boys worked in pairs. The had to work closely with the boys who were drawing the map at each adjoining section. They drew in all of the roads, parks, estates, rivers, buildings, shops, schools, churches etc in the area. Last week, 4th class went on a river walk where we walked along the Twopot and Curraheen rivers. We learned about the source of a river, the mouth of a river and we saw a tributary, meander, confluence and waterfall.These rivers eventually flow into the River Lee, the Lee estuary, Cork Harbour and the Celtic Sea. Last week 4th class had a visit from Lt Cmdr Neil Manning of the Irish Navy. Neil is captain of the L.E.James Joyce and he spoke to the boys about his career in the navy so far, missions he has been on in the Atlantic, the Irish Sea and the very special mission he went on to the Mediterranean in the summer of 2016 when he and his crew rescued over 3,500 people during that summer. He showed us a fantastic slideshow of all the photos and videos he took along the way. The boys had loads of questions for him!!! With a fantastic score of 92%, we won last week's Golden Boot! Well done boys! Seán Dooley won the Seanfhocal competition for 4th class with a fantastic entry. Fourth class sang The Field's of Athenry along with playing Ireland's Call on the whistle. This week in Visual Arts, each boy made a St Brigid's cross to celebrate her feast day on February. The boys used lollipop sticks, paint, glue and coloured card. On Thursday the 18th of January, 4th class visited the CIT to watch part of the VEX Robotics competition.We visited stands with robots and other Science projects. The boys really enjoyed the visit. Trials for the School Soccer team have now concluded and a panel of 16 boys has been picked to train after Christmas. The tournament kicks off in March. Last Friday, the 17th of November, our boys had a fantastic time in the GAA club where we welcomed the Lifetime Lab and their very tricky puzzles. Some of the teachers struggled a bit, but the boys had no problem solving the puzzles! On Tuesday, October 24th, Jennifer Hickey from Junior Golf Ireland called to our school for 4 hours. She coached every boy from 4th class to 6th class. We were putting, chipping and even hit a few full golf shots in the halla. The boys thoroughly enjoyed the day.Eat your heart out Rory McIlroy! This Wednesday, we had a phenomenal 100% record for Walk on Wednesday, the maximum score possible! 8 boys walked, 13 used the Park 'n Stride system, 2 scootered, and 5 carpooled. One boy was absent so we had 28/28, a new school record! Well done everyone! Cork City win the league, and one of our pupils played on the pitch at Turner's Cross at half-time, and managed to get on television afterwards! The boys have been working very hard on creating their own map of Bishopstown, which includes roads, shops, schools, rivers, churches, local businesses and clubs. Yesterday, on the 11th of September 2017, Mr Carroll and Ms Crowley's 4th classes went on a river walk. We learned about the Source of a river, and we walked along both the Twopot and Curraheen rivers. We saw the Confluence of those two rivers, as well as seeing a Waterfall and a Meander. We got back to school just before the rain came! Last week, we visited the Moon in CIT! 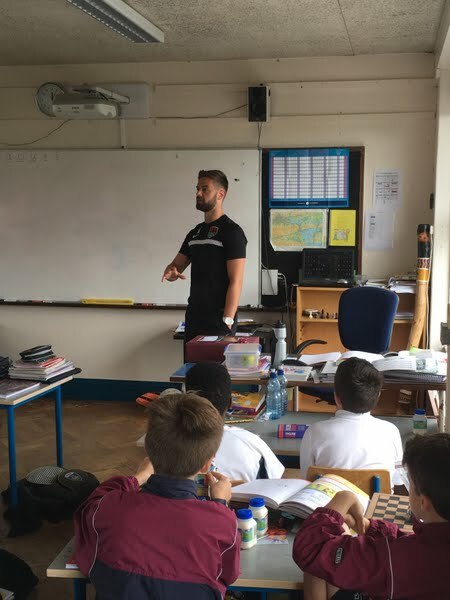 Greg Bolger of Cork City called to 4th class yesterday to present a Clonakilty Foods hamper to a boy in our class for winning a recent colouring competition. He stayed for a Q&A as well as an impromptu kick around in the yard. Thanks Greg! Lifeguard James called to the school to tell us about his job at Owenahincha beach, about water safety and about dangers at the beach (both inside and outside of the water!). The boys loved listening to his stories and paid attention to the all of advice he gave. Here's to a safe and happy summer at the beach! 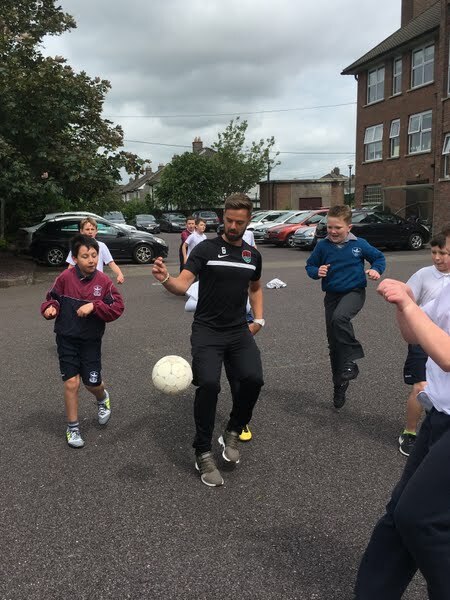 Last Friday, 4th class went to the CIT and were coached by student teachers in Gaelic Football and Athletics. The boys had a fantastic time. As part of Seachtain na Gaeilge, we had a Lá Glas and a game of Bingo. 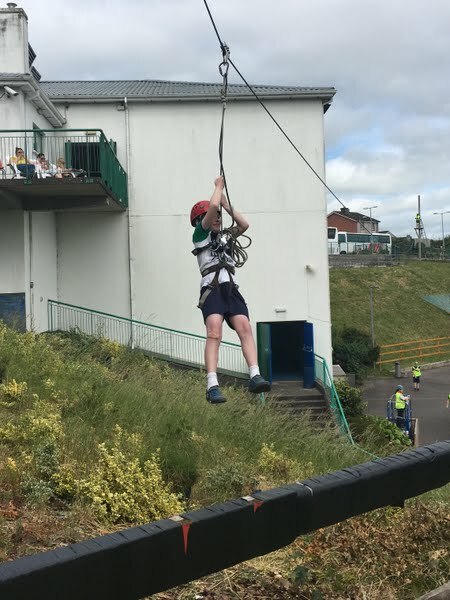 Here's a photo of some of the 4th class boys having fun. Some of our class at last night's Cork City v Sligo Rovers game, as part of a prize won by David McElligott of this parish. David designed a jersey and won tickets for 4th class to go to the match, a family pass for himself, a Clonakilty Pudding hamper and a visit from a City player. Well done David. City won 2-1! Another champion in the class, this time for Swimming, complete with his Medal and Certificate! 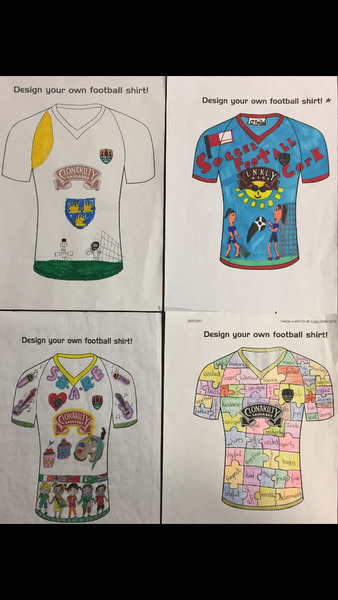 Below are some of the entries submitted to the Clonakilty Take Pride in Your Jersey Competition, where National School children from all over Cork were tasked with designing a jersey for their school. David McElligott, of the 4th class parish, won for himself a Family Pass to a Cork City FC match, a Clonakilty Sausages hamper, and €1 tickets to the City match for his whole class in the competition. We are going to City v Sligo Rovers on Monday the 13th of March at Turner's Cross (aka Field of Dreams!). We have just finished a section on Australia. The boys loved learning about the animals, cities, food and customs of Australia. They especially loved finding out about the Aboriginals, their pastimes, beliefs and of course the boomerang and the didgeridoo.